Effective tips for surviving food-focused gatherings, defeating stress, cooking smart, sneaking in exercise, and optimizing sleep. Plus, clever recipes and great book recommendations! The holidays can bring a perfect storm of Diabetes Landmines: sugary foods, stress and frustration, lack of sleep, limited time for self-care, and more. How do we cope? This column aims to go beyond the conventional advice with more specific and nuanced tips, including some that are controversial or counterintuitive. For instance, we’ve all heard the refrain, “It’s all about moderation – enjoy and love your favorite foods in smaller portions.” This advice drives me crazy in its over-simplification of reality. Some people excel with moderation – they can see a delicious food and eat a sliver of it and not go back for more. I’m terrible at moderation in many cases; avoiding the food entirely is often easier and requires less willpower than planning on moderation. I do rely on moderation in some situations – e.g., when I feel way too busy to exercise, doing five minutes is my goal. However, other situations make moderation impossible: am I really going to eat a sliver of a large buttermilk biscuit and throw the rest away? All 32 holiday tips are shared below in four categories: food, mindset, exercise, and sleep. Finally, learn more in my book, Bright Spots & Landmines, available as a free PDF, free audiobook, and for $6 in paperback on Amazon. Define my stress toolbox – when holiday stress hits, what will help calm me down? Beware the “All or Nothing" mentality: "Well, I don't have an hour, so I can't exercise"
1. Use cauliflower for “mashed potatoes” – it is delicious and nearly indistinguishable from traditional mashed potatoes. The huge advantage of using cauliflower is fewer carbs and a smaller impact on blood sugar vs. white potatoes. 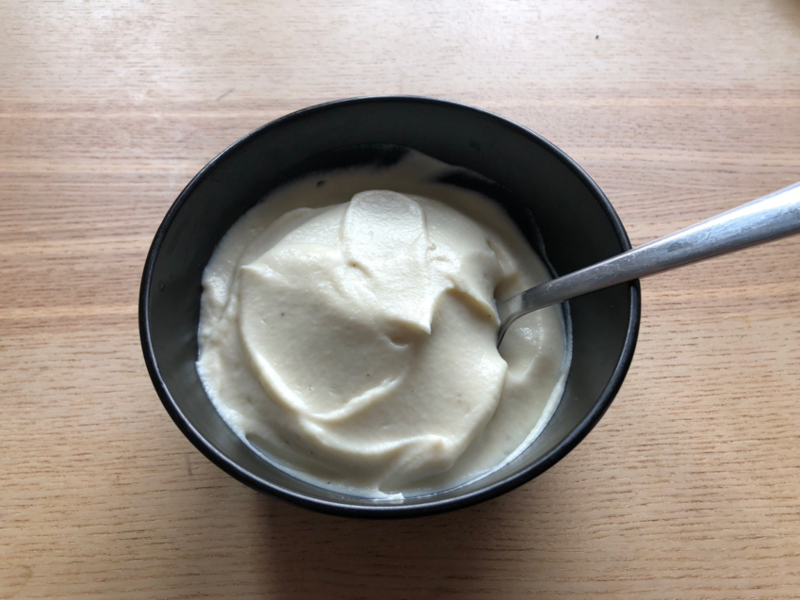 Cauliflower mashed potatoes are super easy to make (~20 minutes): steam cauliflower and blend it with garlic, olive oil, and a few other ingredients. (A normal blender works great instead of a food processor.) See easy recipes from Allrecipes, Food Network, and NomNomPaleo. I took the picture below on Sunday after making the Allrecipes version – delicious and super easy! 2. Know my “domino foods” – once I have one, I cannot control myself and I eat a ridiculous amount. Salty, crunchy foods fall in this bucket for me, including chips, popcorn, and crackers. I actually personally find it easier to have none of these foods, rather than making an unsuccessful attempt at moderation. I never regret avoiding them, but always regret having “just a few” – that’s because my “just-a-few” molehills always turn into a mountain of regret and high blood sugars. I know avoidance is not easy for everyone, but for domino foods, I find complete abstinence is easier than moderation. Another approach is to have a substitute for the domino food that fills the taste craving but is lower in carbs – for my salty, crunchy preferences, peanuts, almonds, and pumpkin/sunflower seeds work well. If I’m venturing into unfamiliar food territory, I might even bring some with me as a backup or get some along the way. 3. Avoid the “I’m-off-the-wagon” excuse trap: “Well, I’ve messed up my eating plan for today. I’ll get back on the wagon tomorrow/next month/in the New Year.” As I mentioned in my column, Why Did I Eat the Chips?, when stepping on a diabetes landmine, the #1 most important response is to get back on track as soon as possible. Making “I’m already off the wagon” excuses just gives myself room to make more mistakes. When I mess up, I want the next decision to steer me back in the right direction. 4. Use food questions from friends/family as a teaching opportunity. In January, I shared a New Year’s Day story that illustrates this point. I went out to dinner with a big group of people, most of whom I was meeting for the first time. The restaurant was known for its pizza, so the table decided to order multiple pies and split them. I ordered my own individual dinner salad, which naturally drew some judgmental questions and inquisitive looks from the group – most of whom I was meeting for the first time. “Nope.” I paused, and then calmly explained my personal approach to eating, showed my continuous glucose monitor, talked about how I try to navigate blood sugars at restaurants, and the blood sugar/mood/energy consequences of not doing so. My eating companions really appreciated the perspective, and we went on with the meal. When deviating from social norms, I always try to reframe the situation on different terms: are the questions from others a nuisance or a teaching opportunity? I always choose the latter. In my experience, people understand unconventional choices if I explain the WHY thoughtfully. The same was true for me in college, when I decided it was easier not to drink alcohol. My reasons: (i) alcoholism runs in my family; and (ii) diabetes is much more difficult to manage with alcohol. In fielding questions about this, people always understood when I explained the reasons. 5. Fill half of each plate with veggies and eat them first. At my family’s holiday gatherings, we usually have a help-yourself family-style food lineup, where a variety of mains and side dishes beckon. I always go straight for the veggies (ideally greens) first, filling half of my plate. Using 50% of my plate’s real estate on veggies prompts more in-range blood sugars, fills me up, and leaves less room for higher-carb, blood-sugar-spiking side dishes. If you do choose to eat carbs like potatoes or bread, I highly recommend eating the veggies and protein first before carbs – this will give insulin time to start working before the carbs quickly increase blood sugar. A small study of this strategy found that eating vegetables and protein first led to 37% lower blood glucose levels 60 minutes later. What about potatoes? I don’t count them as a “vegetable” and don’t eat them – they always spike my glucose frustratingly quickly, especially in easy-to-overeat French Fried form. I find it easier to avoid potatoes entirely and choose lower-carb side holiday veggies like greens, asparagus, broccoli, cauliflower (especially mashed; see above), peppers, onions, mushrooms, etc. 6. Make pasta and ramen using shirataki noodles. 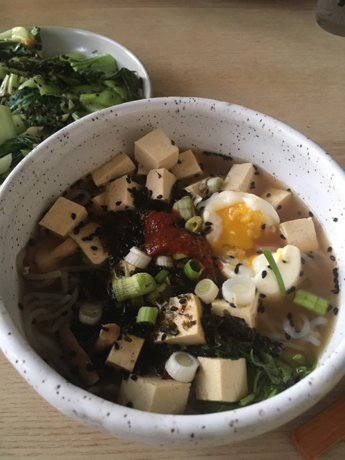 A few diaTribe readers told me about these amazing, super low-carb noodles about six months ago, and they are now a near-once-weekly staple in my diet. Most importantly, they really do taste like normal pasta, but with almost no carbs. 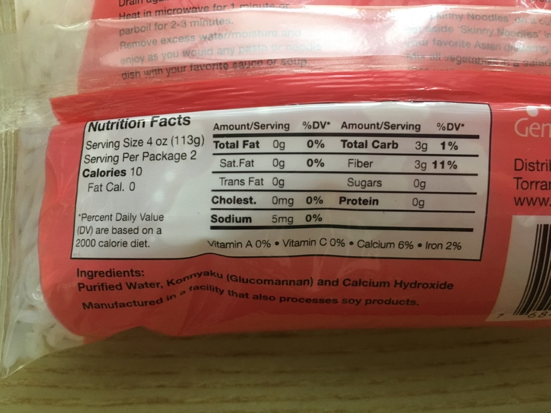 Shirataki noodles are made from the root of an Asian plant (konjac), and each serving has 2-3 grams of carbs with 100% of those carbs from soluble fiber. 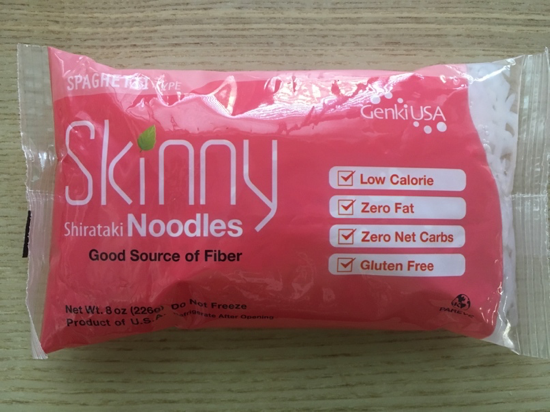 I’ve tried both Skinny Noodles and Miracle Noodles, and I buy the former in a 12-pack case from Amazon. At about $2.50 per serving, shirataki noodles are more expensive than normal pasta. Still, relative to cutting out pasta and noodles entirely – which is what I did for years – these are a nice addition to the toolbox. The noodles take only a few minutes to prepare (rinse, place for 2 minutes in boiling water, dry in a hot and non-oiled pan for 1 minute) and are super versatile: we’ve made ramen with them (picture below) and traditional spaghetti using both pesto and red sauce. Kelp noodles and zucchini noodles (zoodles) are other pasta alternatives low in carbs, but I’ve found them higher hassle and crunchier than normal noodles. I also love that shirataki noodles can be stored in the pantry and I can make them when there is no fresh food in my fridge. 7. 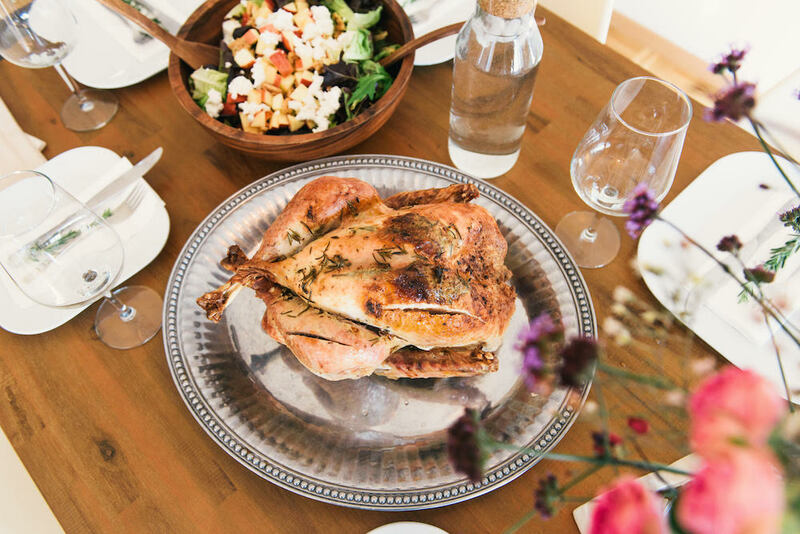 “Eat defensively” – fill up on veggies or other lower-carb options at home before a food-focused holiday event, uncertain restaurant meal, etc. I use this strategy from time to time, and I love how it guards against challenging situations with no optimal choices. If I go into a meal 50%-75% full, I’m less likely to overeat or stumble on Food Landmines that drive my blood sugar high. 8. Beware of constant grazing and “carb stacking,” which is so easy at holiday gatherings. Carb stacking is short hand for “eating tiny amounts of unplanned carbs repeatedly, without measuring them out or realizing the blood glucose snowball I am creating.” Think of the huge bowl of chips or crackers or popcorn and the “I’ll only have a little” trap … and then a “little more” … and before I know it, I’ve eaten 60 crackers (one by one), have kind of taken some insulin along the way (but not nearly enough), and am facing high blood sugars for hours. When going into a holiday gathering, I resolve not to constantly graze from a giant communal bowl or bag – putting them on a plate first helps build some awareness of how much I’m eating. If you find yourself carb stacking, notice it and respond accordingly: check blood sugar; go for a walk; take insulin if more is needed; etc. This tip is among the hardest for me to implement and the easiest to forget – I just fell into this trap on Halloween as I grazed on popcorn from a gigantic bowl. Read more on this topic here. 9. Ask: “Am I actually hungry, or am I bored, tired, or near food?” Around the holidays, tempting food is everywhere: around the house, at social gatherings, in gifts, and beyond. This is the perfect environment design for overeating sugar and white carbs, especially when I’m not even hungry. 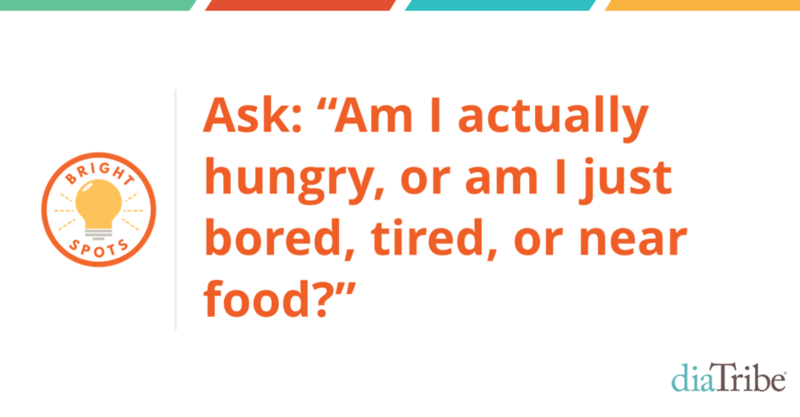 The “Am I actually hungry?” question helps remind me that I’m probably NOT hungry, but simply smelling or noticing nearby food, procrastinating, or feeling sluggish or bored. If I wander into the kitchen after a filling meal, I always try to ask this question before I reach any further. 10. When traveling, bring/buy predictable snacks as a just-in-case backup. For a recent wedding in Mexico, I stopped at a local chain grocery store and secured 2 lbs of roasted almonds, just in case. This helped alleviate anxiety about the delicious high-carb meals and snacks – I knew I didn’t have to overstuff myself, since I had my own predictable backup snack in my room. Plus, the almonds ended up being a last-minute snack for the bride and groom right before the ceremony! 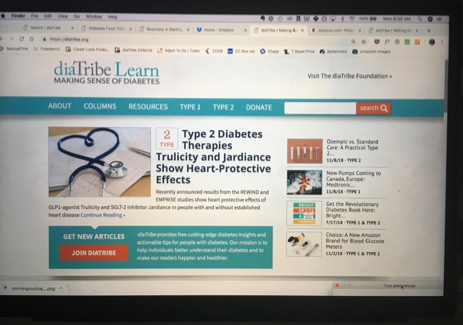 Get more diabetes and travel tips here. 11. Use almond flour or coconut flour as a substitute for baked goods, breadcrumbs, and pizza crust. Recently I’ve been using Anthony’s brand, purchased in large bags here (almond) and here (coconut). These flours have a much lower impact on blood sugar, since they have 3-4 times fewer carbs and more fiber than traditional flours. For example, 1/4 cup of almond flour has about 5 grams of carbs (60% from fiber), while 1/4 cup of white flour has about 25 grams of carbs (only 4% from fiber). Whole wheat flour does have slightly more fiber than white flour, but it has just as many carbs; that’s why I like almond or coconut flour. You can find tons of amazing almond flour and coconut flour recipes in low-carb cookbooks and blogs like All Day I Dream About Food. 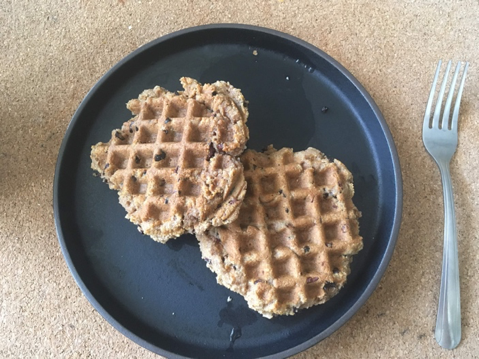 Personally, I make these almond flour waffles (less than seven minutes! 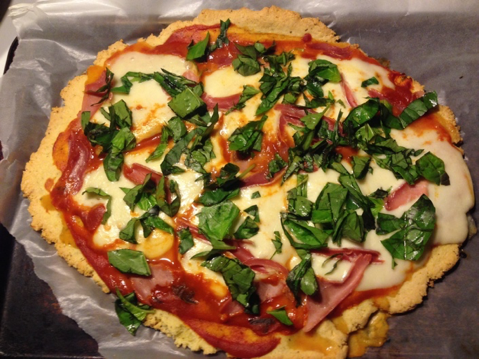 ), these almond flour pancakes, and this almond flour pizza crust. Those with a chocolate sweet tooth can bake with no-sugar Lilly’s dark chocolate chips or ChocZero. Personally, I cannot buy Lilly’s or ChocZero, since I find them too delicious and massively overeat them. If you find moderation tough, be careful with no-sugar “free” foods – they can really add up. 12. Calories per day vs. carbs per meal – where to focus? I vote carbs per meal. Much of the common holiday food advice focuses on reducing calories per day and considering the day’s overall budget. In this framework, all calories are treated equal; as long as you stay under budget, you’re clear. Instead, I focus on limiting carbs per meal to less than 30 grams, which is the single best strategy I’ve found for keeping my blood sugar in range (70-140 mg/dl) most of the time with less diabetes effort. Since both high and low blood sugars can cause hunger, more time-in-range matters for overeating: I’m less hungry and less obsessive about food when my blood sugar is in range. Plus, eating more fat (nuts, seeds, olive oil) and moderate protein provides really filling meals, meaning I’m less likely to mindlessly graze or want more food in an hour. One way to think of low-carb is like an eating “operating system,” meaning a set of principles I can apply and implement at each meal, guiding me towards more time-in-range and less diabetes hassle. Personally, I find low-carb is the easiest operating system to execute, since I know which foods do/do not fit into my per-meal constraints, and I know any mistakes will result in small glucose changes. My complete eating plan is in Bright Spots & Landmines (free PDF, free audiobook, paperback, Kindle). Of course, many people find the low-carb operating system difficult, and these strategies are not mutually exclusive. A low-calorie diet is likely to be lower in carbs per meal, and low-carb eaters may also eat least calories (or burn more) over the course of the day. Both camps would also agree that the most important goal is to limit sugar intake, which can really prompt high blood sugars. I wake up with a super high blood sugar the morning after a large holiday dinner. Does it make sense to eat breakfast? I’m not hungry for dinner after a huge early-afternoon holiday meal. Does it make sense to eat dinner? I woke up for an early flight, only got four hours of sleep, and will be sitting for the next six hours. Does it make sense to eat my usual breakfast or lunch? In all these cases, I would skip the meal. Obviously, this can bring risks of low blood sugars, but in the three cases above, the risk is low in my experience. Since I use a continuous glucose monitor (CGM) and my basal insulin needs are pretty stable, I can feel more confident skipping meals. You may be very different! The broader lesson here is to pay attention to one’s body – eat when I’m hungry and ideally when my blood sugar is in range, pause in other cases. I have more to say on this topic for a future column about 16:8 intermittent fasting; so far, I’ve collected over 130 days of data and I’ve noticed many advantages (left picture) and some disadvantages (right picture). Like all tools in diabetes, this one is not perfect. Rely on vegetables as the core side dish, making clever swaps. Most holiday events have green veggies on hand, and reframing these as my main side dish helps a lot – filling half the plate. I’m also a fan of lower-carb swaps: shirataki noodles (see above), zucchini “zoodles,” kelp noodles, and spaghetti squash can stand in for pasta, while blended cauliflower (see above) can be used to make rice and delicious mashed potatoes. Eat berries instead of traditional desserts. Raspberries and strawberries are especially low in carbs/sugar and higher in fiber than other fruits, translating to a smaller impact on blood sugar. Use almond flour or coconut flour as a baking substitute – see above. 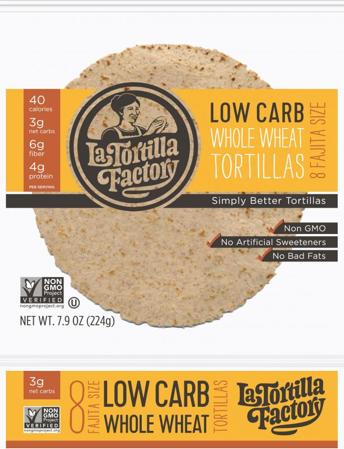 Use La Tortilla Factory’s low-carb, high-fiber, whole wheat tortillas as a bread substitute. They have a yellow-branded package and are sold at many grocery stores – search your zip code here. Since over 70% of the carbs are from fiber (8 grams of fiber, 11 grams of total carbs), they have a small impact on blood sugar. In restaurants that serve free bread or chips, see the tips here. 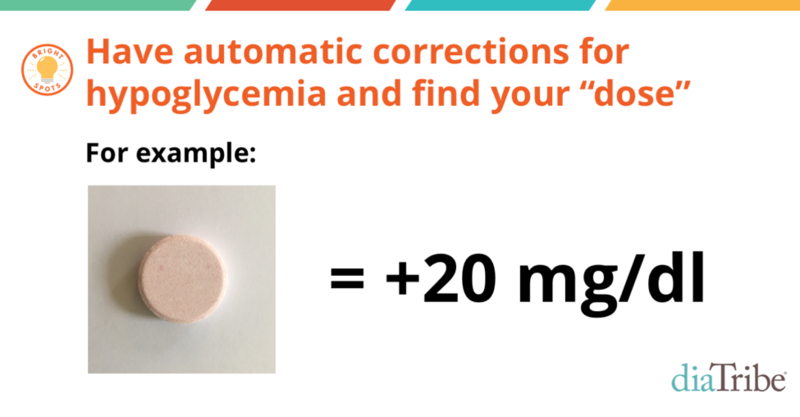 Have go-to automatic corrections for hypoglycemia that are quantity limited and unappealing to overeat. Glucolift glucose tablets are what I use, since they relieve my low symptoms very quickly and I know I won’t overeat them. The important thing here is to have something automatic – if a low happens, I treat it with ____. Fill in the blanks: Eating ___ (amount) of ____ (food) raises my blood sugar by ____ mg/dl. For example: eating one glucose tab raises my blood sugar by 20 mg/dl. Knowing this helps me adjust the amount of food to raise blood sugar to my target of 100 mg/dl, but not overshoot. If I’m at 60 mg/dl, I know I need only two glucose tabs to get back to 100 mg/dl. The idea is to figure out the right “dose” of carbs to correct a low, just like I would take a dose of insulin to correct a high. The best way to discover this is by checking blood sugar, eating a food that has been measured out, and then checking again in roughly 15-30 minutes. If you are on a closed-loop system, it’s easier to overdo hypoglycemia corrections, only to go super high afterwards. This is because when blood sugar starts trending down – say 80 mg/dl and dropping – the pump suspends insulin to avoid the predicted low. While this avoids lows much of the time, it doesn’t always work (e.g., exercise). If I do get low on a closed loop system, I might not have received basal insulin for the past 30-60 minutes. Eating on top of that pump suspension overcooks the correction, driving glucose even higher. I’ve made this mistake so many times on Loop! If my pump has been suspended, I usually take half my normal correction carbs to get back to target. 16. Check blood sugar 2-3 hours after meals (or wear CGM) to catch highs and lows quickly and make course corrections. This is critical for unpredictable holiday meals, which are often high in carbs and preceded by lots of unmeasured snacking. I aim to be in the range of 70-140 mg/dl within 2-3 hours after eating, which is only possible with frequent glucose monitoring. 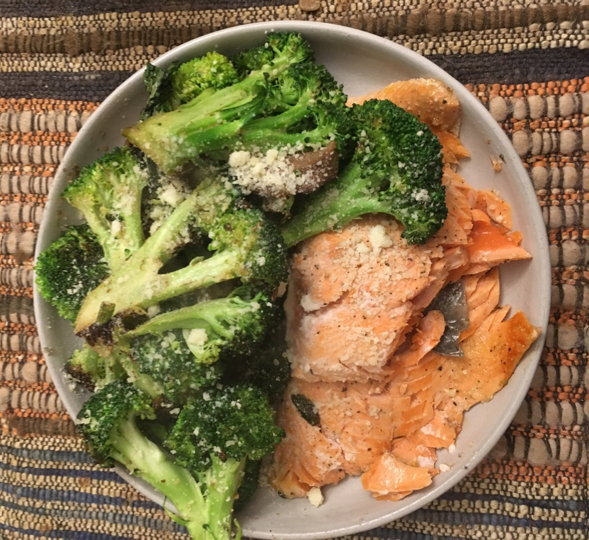 When it comes to unfamiliar meals, more than half the time I end up out of my goal range, despite my best efforts; in these cases, my goal is to get back in range as soon as possible, which could mean going for a walk, taking additional insulin, or simply waiting for the insulin that is already working. 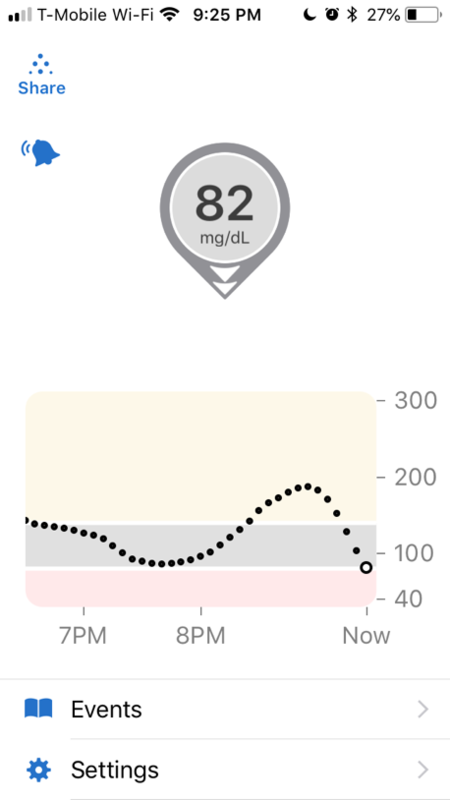 I generally assume about 2/3 of the mealtime (bolus) insulin I took is gone after two hours – e.g., for a 3-unit bolus taken two hours ago, I would have 1 unit of insulin on board remaining. Do not interpret this as advice for you, as you may be very different, especially because larger-sized doses can still lower glucose 4-6 hours later. Safety Note: always account for “insulin on board” or “active insulin,” meaning a bolus insulin dose taken in the past 3-4 hours that may still be lowering glucose. “Stacking” too much new insulin on top of insulin on board (“IOB”) can lead to low blood sugars. With the rule noted above, I always have a rough sense of how much insulin is still “active” and therefore how much further I expect my blood sugar will drop. 17. Aim for an earlier dinner, avoid post-dinner snacking, and beware of huge late-night meals. Eating a lot of food late at night, no matter what’s in it, often results in high overnight blood sugars, much poorer sleep, and a worse start to the next day. 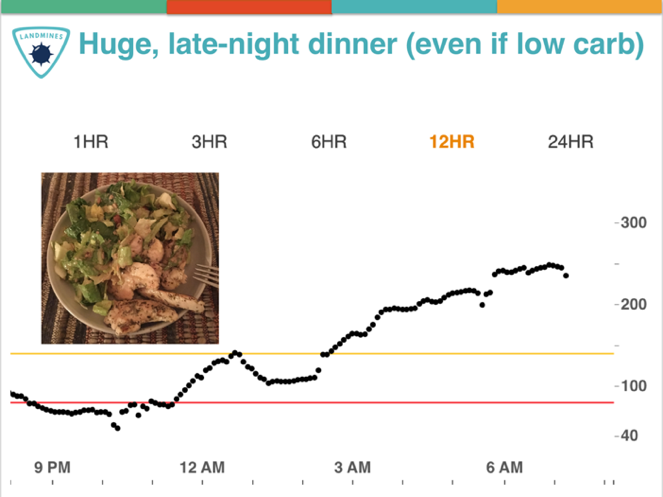 See the example below, which shows my skyrocketing blood sugar trace after eating four massive plates of chicken Caesar salad – everything homemade, no croutons, no bread. (Certainly, it would look much worse if carbs were thrown on top of this!) My goal is a lighter, earlier dinner without snacking afterwards – it almost always improves my overnight time-in-range (70-140 mg/dl). Of course, this isn’t always possible during the holidays, but it’s a helpful goal to keep in mind! Implementing this strategy often requires eating more during the day. 18. 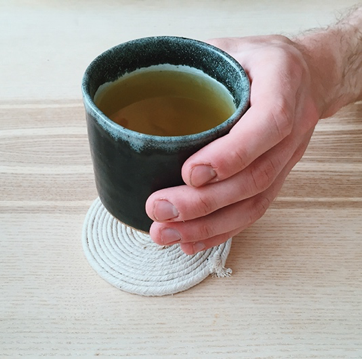 Fill up on liquids before meals and snacks: 16 oz of water, tea, or broth. Often, just filling my stomach with fluid solves my snack cravings, and applying this strategy before big holiday meals can drastically reduce how much I want to eat. 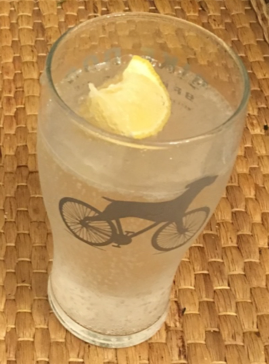 I drink a lot of sencha green tea and sparkling water with a lime. 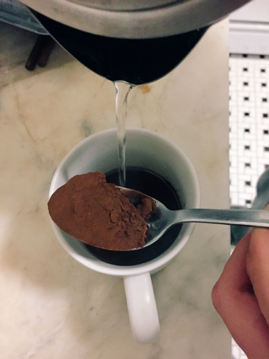 When I’m starving and tempted to overeat at night, I’ll often whip up a dark chocolate drink or homemade broth with Better than Bouillon, miso paste, and hot water. 19. 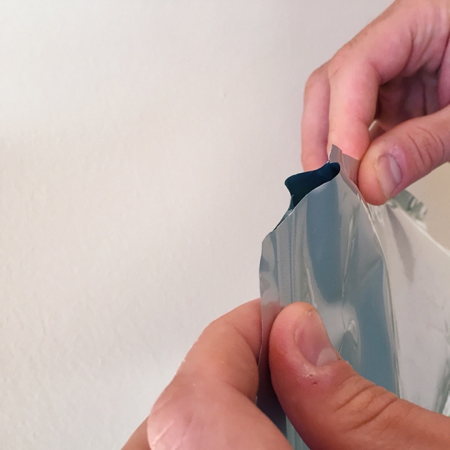 When junk foods come home, make them harder to access and less visible – top shelf of the pantry, smaller hole in the bag so pouring is more difficult, a difficult to open jar, etc. These strategies are effective at cutting my consumption, since they reduce visual cues and require more effort before consumption. The worst thing to do is to put any sugary, carb-y foods right on the counter in plain sight, which almost guarantees overeating them. Of course, the best play of all is to keep junk food out of the house completely: if it’s not around, I cannot eat it. The out-of-the-house barrier is truly effective – very few cravings are motivating enough to go out to the store and obtain the desired food. Click here to go back to the table of contents. 20. Define my stress toolbox – when holiday madness hits, what will I use to calm down? 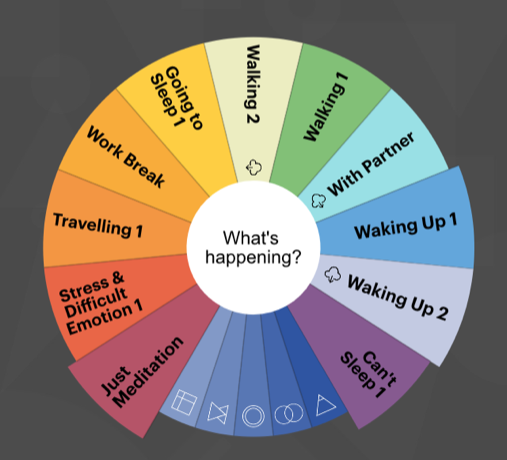 What is different about my lowest stress days that is within my control – what habits, choices, and activities enable low-stress days and how can I duplicate them? Stress can drive blood sugars quite high, so it’s definitely an area to focus on around the holidays. I find it helpful to have a preloaded, written menu for dealing with stress, which makes it easier to respond productively in the moment or to prevent stress from occurring in the first place. Here’s my toolkit, which will obviously vary by person; I encourage you to develop your own! 21. When monitoring glucose more frequently after holiday meals, remember: the numbers are neutral information to make a decision, not “good” or “bad” grades or “tests.” I cannot understate the importance of this framing, since it takes blood sugar monitoring from an annoyance (“Ugh, 252 mg/dl, another bad number, I’m terrible at this”) to a useful, helpful partner that informs decision making and learning (“252 mg/dl – ok, what can I do now?”). 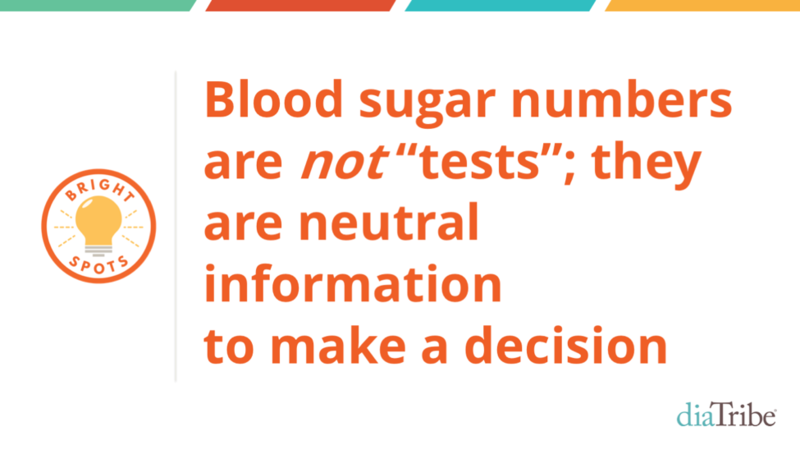 This is especially critical for those wearing CGM, since the real-time data can feel like a constant grade and there are 42 factors that affect blood sugar! Instead, view glucose data as a speedometer that helps inform diabetes driving. Read more on this tip here. 22. Breathe mindfully for five minutes. I aim to do this every day, but it is especially vital on stressful days – the five minute investment is an amazing holiday gift for reduced stress, improved focus, and less reactivity. Do NOT give up if you find this difficult (I still do) or if previous apps didn’t work out (I have deleted many). Like many things in diabetes, iterating to something that works for you is most of the battle, and what works might change over time. 23. 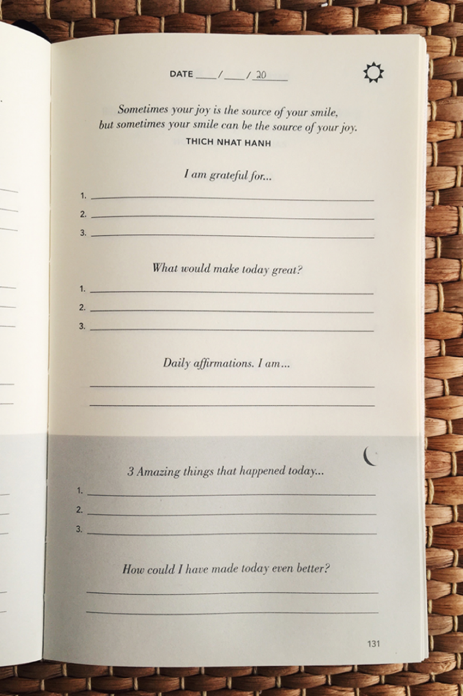 Use the 5-Minute Journal, which has radically improved my gratitude and Bright Spots thinking. Read more about why and how I use this daily journal here. 24. 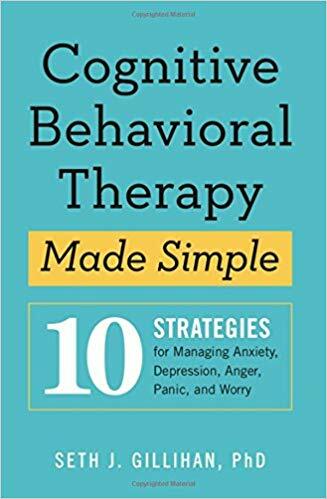 A spectacular, just-published book: Cognitive Behavioral Therapy Made Simple. The book’s subtitle says it all: 10 Strategies for Managing Anxiety, Depression, Anger, Panic, and Worry. I just finished reading this and found many gems from author Dr. Seth Gillihan, especially the chapter on negative thoughts – it is stunningly good for combatting unhelpful diabetes thought loops. On some pages, I underlined or starred almost everything. I’ll write a dedicated column applying some of these strategies to diabetes, but for now, I enthusiastically recommend getting the book or buying it as a holiday gift for loved ones. 25. Walk, especially before and after meals and to correct a high blood sugar. This is one piece of “conventional” holiday advice that I wholeheartedly endorse. Without a doubt, walking is one of the most important therapies I use every day to benefit my diabetes, but it’s also one of the most underrated. 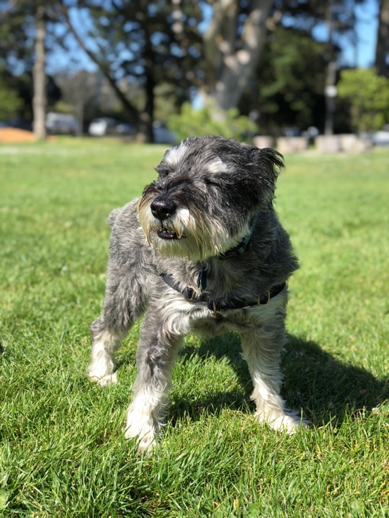 I’ve shared some of my data in a previous column – typically, walking drops my blood sugar by about 1 mg/dl per minute (-20 mg/dl in 20 minutes), though I’ve seen changes as big as -100 mg/dl in 25-30 minutes! This is a powerful strategy to use after meals, particularly if blood sugar is high or trending high. Just beware of post-meal low blood sugars if you are on insulin, especially after a big meal or large insulin dose; for me, walking can double the effect of insulin, meaning a 3-unit dose might work like a 6-unit dose! 26. Beware the “All or Nothing" mentality: "Well, I don't have an hour, so I can't exercise." During busy, stressed holidays, this mental trap is especially easy to fall into, and the result is no exercise at all. 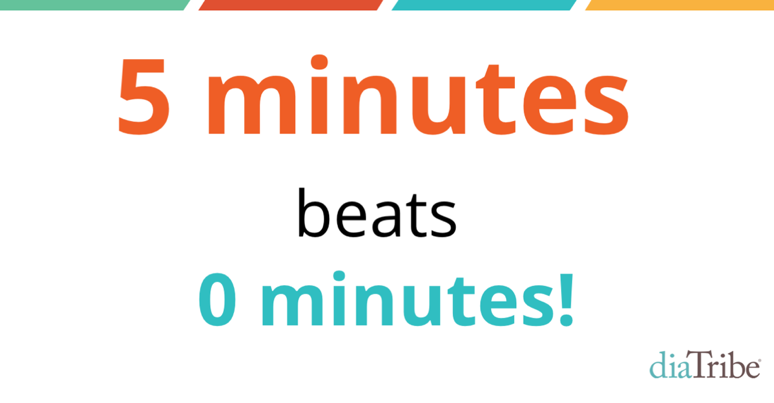 My solution is simple but powerful: Five Minutes Beats Zero Minutes. For me, thinking smaller actually helps me accomplish more than what I would otherwise do: nothing. It might sound un-ambitious to do 50 jumping jacks at home before work, or to briskly walk up one hill as I walk my dog, or to do a few sets of 15 pushups, or even to use a walking desk. Resist the urge! This liberating reframe – five minutes beats zero minutes – is about making the bar more realistic, not achieving perfection. Of course, once I do five minutes, I’m also more likely to do five more and then five more. If this Exercise Landmine is a challenge for you, read more here and here. 27. 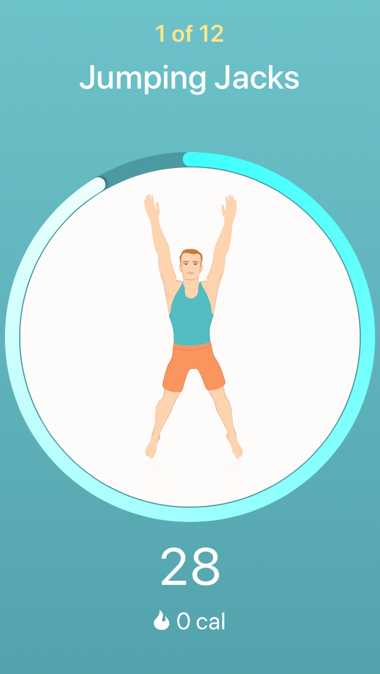 When time is crunched during the holidays, rely on home workouts using bodyweight and apps. I cancelled my gym membership about 18 months ago when I realized something: I was spending 40 minutes just getting to/from the gym, and the workout quality was only 20%-30% better than what I could do at home with my body weight, some basic apps, a pullup bar, and some free weights. 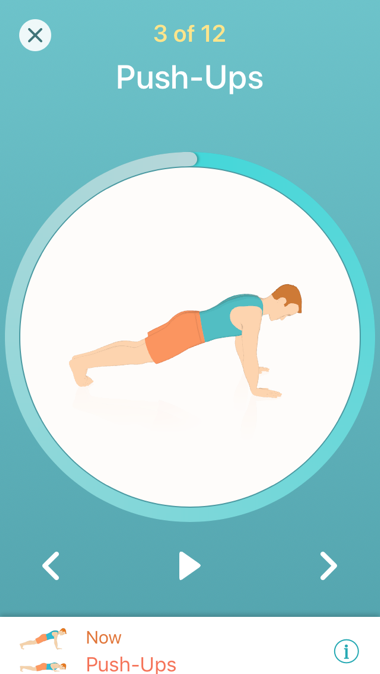 Now, I do home workouts three times per week using the 7 Minute Workout App – I like this version. I’ll add in some pullups ($20 bar on doorframe) and kettlebell swings and rows. It’s not a full gym, but it’s 70%-80% of the workout in far less time. 28. Get 7+ hours of sleep for huge benefits: more in-range blood sugars, less insulin, less sugar cravings, less stress, more energy, and better emotional resilience. Getting enough sleep is arguably the ultimate Diabetes Bright Spot, since it impacts every other area of diabetes discussed in this column. Read more about sleep here and see chapter 4 of Bright Spots & Landmines for more tips. 29. 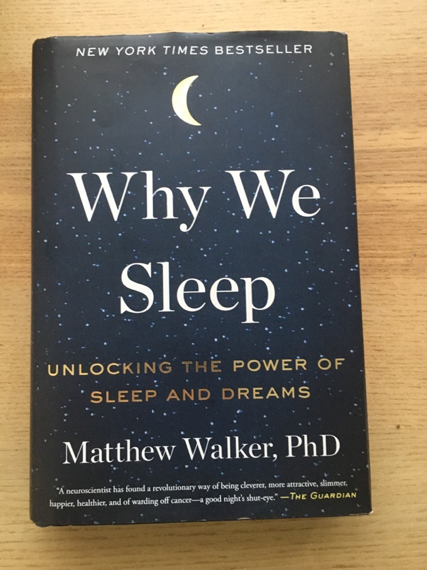 Read Why We Sleep by Dr. Matthew Walker – it’s the best health book I’ve read this year, hands down. The science and insights in this book are incredible for people with diabetes, healthcare providers, and diabetes educators. I’ve written about the importance of sleep, but this book brings the case to a whole new level! 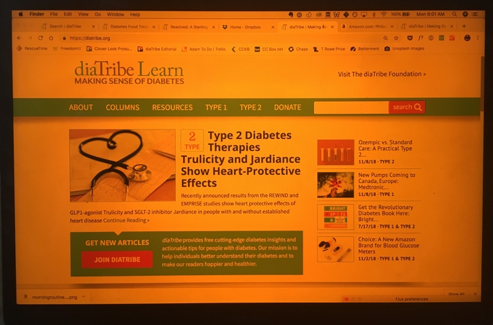 I’ll write more in-depth about the dots it helped me connect, particularly related to emotions and teenagers’ high blood sugars. Turning down the overhead lights in my apartment after dinner and relying on small lamps and night lights (pictured below). 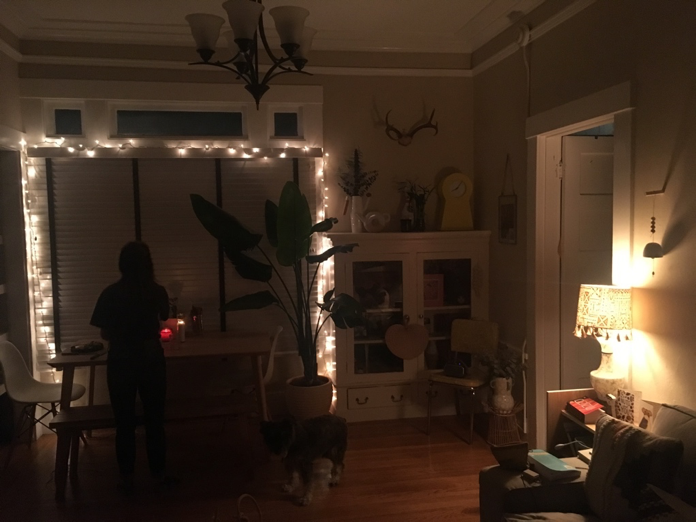 I have an old school Edison bulb (incandescent light) in a table lamp, plus a string of white Christmas tree lights in the living room – both provide just enough light to read, but not too much to keep me up late. My bedroom has a bedside alarm clock that doubles as a lamp with a dimmer to adjust brightness (Philips Wake Up Light). Not using any screen within an hour of bed, or installing an app like f.lux or using Night Shift mode (on Apple devices) to change a screen’s color temperature based on time of day. f.lux and Night Shift mode automatically reduce the amount of blue light from a screen as the sun sets, which may improve sleep. The difference is remarkable when you see them side-by-side – see below. Some companies also make screen covers that limit blue light. A more disciplined option, of course, is not to look at any screens within 60 minutes of bed – I don’t do a perfect job of that every night, but it does make a difference when I remember. Showering before bed in very low light (night light or candle). I’m one of those strange people that showers at 11 pm: the warm water makes me sleepy and frees my mind before the day ends. I shower in near-darkness, relying on dim light only from a wall-plugin night light or a candle. Most bathrooms tend to be very bright and reflective, a poor combination right before bed. In hotel bathrooms, I turn on my phone’s flashlight and put it on the counter, pointing downwards. 31. Make sure the room is cool enough to fall asleep (~65 degrees). The National Sleep Foundation reports that a cool room temperature of around 65 degrees Fahrenheit makes for the best sleep. This definitely backs my own experience: I sleep far worse at other temperatures, particularly in hotter rooms. I’ve also found my overnight BGs stay in range more often at cooler room temperatures, while warm rooms seem to drive my BG high – and thereby, worsen life the next day (higher BGs to start the day, less energy, worse mood). Adjusting the thermostat is not an option in my temperate San Francisco apartment, so I’ve taken to using a lighter blanket, a cooler mattress (Casper), lighter sleepwear, and a small floor fan. 32. When unable to sleep, get out of bed and do something relaxing. I like to read a physical book using a dim book light or using some guided breathing to relax. The worst thing to do, according to sleep experts, is to lay awake in bed and ruminate (e.g., to-do’s, stress, how long it’s taking to fall asleep). If I don’t feel tired and have been in bed for more than 30-45 minutes, I’ll usually get up and read. Please send questions and feedback here! As noted above, we’ll do a once-weekly Facebook Live to share reader tips and answer questions.